Income inequality is a danger to democracy and it makes social problems worse. In nations with great disparities in income, social problems, poverty, crime, drug use, etc., are worse than in nations with less income inequality. Great concentrations of wealth are a threat to democracy. Associate Justice of the US Supreme Court from 1916 to 1939, Louis Brandeis, said that you could have democracy or great concentrations of wealth, but not both at the same time. I agree. There are two models for the organization of society, the Democratic model and the Republican model. I support the Democratic model. 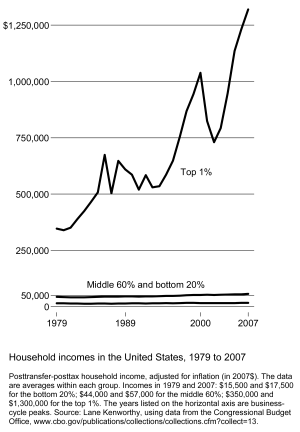 Under the Democratic model, income inequality is lessened by taxes and safety net programs. Republicans oppose both. I am not advocating total income equality. I am saying that having millions struggle to survive on or near the minimum wage while a few receive billions of dollars is morally wrong. In my opinion, no one is worth a billion dollars annually or cumulatively over a lifetime. The Republican model is a patriarch one buttressed by religion. Not every Republican embraces this model, but the leadership of the party do as they channel the wishes of the 1%. Under the patriarch model, father knows best, children speak only when spoken to, women are silent and minorities know their place. Democracy is given only lip service at home and is used as a cover abroad to support the establishment of unregulated free market capitalism. Nominally Christian, the patriarch model worships profit, no matter how it is denominated, dollars, rubles, pesos or yen.